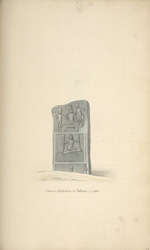 Watercolour drawing of a memorial stone in South India, from an album of 56 sheets of drawings (60 folios) mainly of miscellaneous architecture and sculpture in the Deccan and S. India, dated 1793-1806 from the MacKenzie Collection. Some drawings are by MacKenzie himself, others by his draftsmen, including C. Ignatio. India has a very ancient tradition of erection of memorial stones. These have various local names. The establishment of memorial stones normally followed the death of a hero in a battle and was related to political, social, economic and religious casues. Hero-stones consist of stone upright slabs with carved panels and inscriptions and generally depict the hero in combat with the enemy.